Boston cream pie is an unusual type of layer cake, made with two rounds of sponge cake that are filled with pastry cream and topped with a glaze of chocolate ganache. It is basically like a giant custard sandwich, and quite unlike most layer cakes. 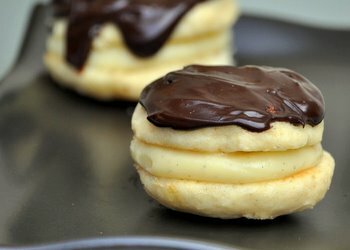 I thought it would translate very well into a whoopie pie format, making a miniature version of a Boston cream pie that can fit right in the palm of your hand. These Boston Cream Whoopie Pies start out with a simple buttermilk vanilla cake that makes a lightly sweet backdrop for the pies. The cake is tender and moist, but still sturdy enough to handle easily without breaking while you frost and fill them. The batter rises well and you don’t need to do anything special (aside from making the mounds even) during baking to get them to keep their shape. The pies are cooled and filled with a homemade vanilla pastry cream. I use a vanilla bean in mine to get the most vanilla flavor into my recipe, but vanilla extract will work, too. Most of the Boston Cream Pies I’ve had have some kind of chocolate glaze poured over the whole cake before serving. This creates a beautiful picture, but I found that wasn’t really practical for a whoopie pie. I topped these with a layer of chocolate ganache, spreading it onto one side of the pie. It was just thin enough to give me a few drips around the edges on some of the pies, but mostly stayed exactly where I put it. This made the whoopie pies easy to store and to handle, and was simply a lot more practical way of topping these. Don’t worry if you have a bit of ganache leftover after you top off your pies. It is good eaten off a spoon, too. The finished pies have a great mix of soft cake, creamy vanilla filling and chocolate glaze. They’re very satisfying – but also light enough to indulge in two at a time if you’re tempted. These pies can be served chilled or at room temperature, but I generally serve them the day they’re made and keep the leftovers in the fridge, well-wrapped. I typically top half of the cakes with ganache in advance, then pipe in the pastry cream before serving. They’re still tasty the next day, but it is hard to beat a freshly made Boston Cream Whoopie Pie. In a large bowl, cream together butter and sugar until light. Beat in vegetable oil and the eggs, adding the eggs in one at a time and waiting until the first is fully incorporated to add the second. Stir in half of the flour mixture, followed by the buttermilk and vanilla extract. Stir in the remaining flour, mixing just until all ingredients are combined and no streaks of flour remain. Drop batter in approx 2-tbsp sized rounds onto prepared baking sheet, as you would for cookie dough. Bake for 12-15 minutes, until cake is set and springs back when lightly pressed. Cake may be very lightly browned around the edges. Pair up the cakes by size, creating pairs of roughly equal size that will fit together well once put together as whoopie pies. Take one half of each of the whoopie pies and spread about 1 tbsp chocolate ganache over the rounded portion of the cake. Allow to set up at room temperature. Fill a piping bag or a ziploc bag with the corner snipped off with the pastry cream and pipe a generous amount (2-3 tbsp) onto the flat portion of the cakes that are not covered with chocolate. Top each with a chocolate covered cake and serve. Makes about 14 Boston Cream Whoopie Pies. In a medium saucepan, combine milk and vanilla bean. Bring to a simmer over medium heat then turn off heat. Scrape vanilla bean into milk and allow to stand for 15 minutes to infuse the milk with the vanilla. Bring milk back to a simmer over medium heat (Skip this step if using vanilla extract and simply bring the milk to a simmer on the stovetop). While milk is heating, combine eggs, egg yolks and sugar in a large mixing bowl. Beat until smooth, then add cornstarch and beat until smooth again. When the milk is done, pour a few tablespoons of milk into the egg mixture while whisking constantly. Repeat this a few times until about half of the milk has been added. It is important to add the hot milk slowly (tempering) so you do not cook the eggs. Add the remaining milk and return the whole mixture to the sauce pan. Cook, stirring constantly, over medium heat until the custard thickens â€“ about 5 minutes. Strain through a sieve into a medium bowl, cover surface of the pastry cream with plastic wrap and store in fridge until ready to use. Stir chilled pastry cream vigorously before using. Combine chocolate, cream and corn syrup (if using) in a medium sized, microwave-safe bowl and cook on high just until the cream starts to simmer. Whisk or stir thoroughly until all chocolate has melted and ganache is smooth. If you add the corn syrup, your ganache will be slightly glossier when it sets, but it is optional and you don’t need to add it to have a good result. What a fantastic idea! Those are so cute! Love the chocolate ganache. Have you tried it with dark chocolate? Wow!! Can’t believe I have never been to your page before. Great site! I found you through food blog search looking for 4th of July treats. Just did a post and shared your strawberry idea. May I please use your photo? 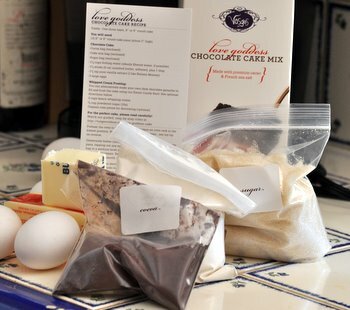 Can’t wait to make these whoopie pies!Thanks! Very clever idea. Love these. 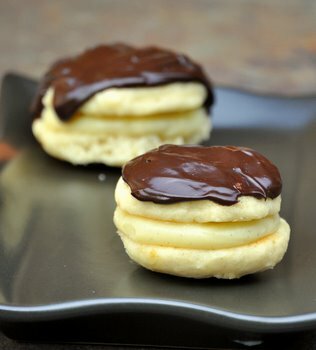 Boston cream pie is my husband’s favorite – I’m going to surprise him with these for his birthday! Thanks for the recipe. I really enjoy that you turned that cake into whoopie pies, such a cute idea! Such a cute idea! My husand loves boston crean pie,so I think this will be a winner. Tried these today – they are great! My family loves them. These are absolutely gorgeous, and really quite clever of you to make them into whoopie pies. I love anything with pastry cream. Very tasty and fun used a whoopie pie pan for the first time. Next time I’ll fill them less. Wonderful recipe! Made for my son’s 10th birthday! My family loved these.